HGC Group of Companies 2018 Year in Review from HGC Group of Companies on Vimeo. VOTED A TOP WORKPLACE FOR 6 YEARS IN A ROW. HGC Construction believes in doing great work with like-minded people. Our team partners with other talented and highly-skilled professionals enjoying industry-leading development programs, frequent growth opportunities, and a results-oriented culture. As a relationship-driven company, HGC builds connections with our Team Members. Together, we celebrate wins, applaud our shared successes, and work to positively impact our clients and our community. From experienced professionals to skilled workforce employees, we remain committed to creating life-long careers that evoke integrity, creativity, quality, safety and collaboration. View our current job openings now. 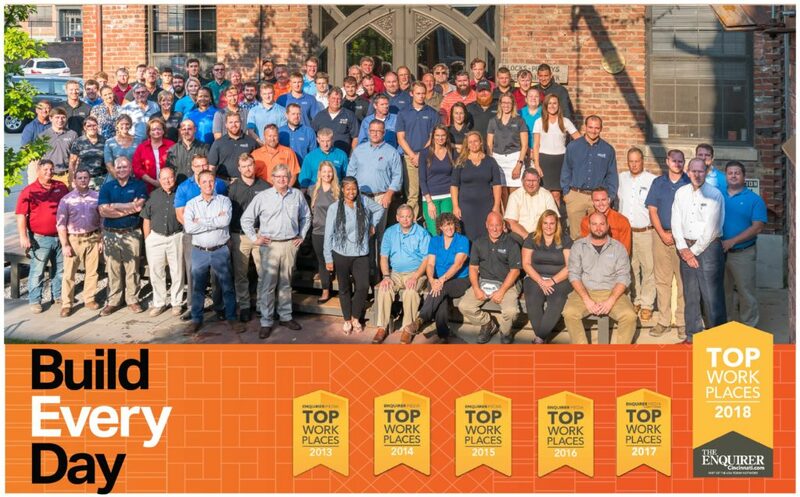 The HGC Group of Companies “Build Every Day.” Whether this is building our client’s dreams, building our communities or building each other, we cannot do any of this without caring for and being committed to our most valuable resource – our people. The HGC Group of Companies is committed to an inspiring, safe and healthy environment for our people. Our benefits are designed to provide competitive health related coverages and also wealth and security programs to assist our employees with ensuring their future is secure and their family’s needs are not only met, but exceeded. Medical coverage is offered in two plan descriptions. Through Anthem Blue Cross and Blue Shield, the HGC Group of Companies offers a High Deductible Health Plan (HDHP) with a Health Savings Account (HSA) to assist with covering your deductible. The HGC Group of Companies provides $400.00/year to your HSA for single coverage, $700.00/year for Employee and Child(ren) or Spouse, and $1100.00/year for Family coverage. There is also a traditional PPO plan available with lower deductibles. Preventative care is covered at 100% for both plans. Prescription Coverage is provided when you enroll in either the HDHP or the PPO. Voluntary Dental Coverage is offered through DentalCare Plus. Preventative services are covered at 100%. Voluntary Vision Care is offered through Eye Med. Employee Assistance Program (EAP) is a service provided to employees and their immediate family members to obtain counseling to cope with stress, grief and loss, legal issues and more. Live Health On-Line provides access to real-time on-line physicians who can electronically call-in prescriptions. 401-k Savings Plan – The HGC Group of Companies offers a 401-k retirement savings account in which pre-tax dollars can be deferred through payroll deductions. A 25% employer match is paid on the first 7% of an employee’s contribution to the plan. Employees are vested in the employer match at 10% after the first year of employment, 50% after two years, 75% after three years and 100% after 4 years. The plan is managed by Mass Mutual. Health Savings Account (HSA) – allows for additional pre-tax funds to be deducted from your paycheck and placed into an HSA to pay for health, prescription, and dental and vision related services. The HSA is connected to HDHP plan. Flexible Spending Account (FSA) – additional pre-tax funds can be deducted from you paycheck and placed into the FSA to pay for your health, prescription, dental and vision related services. The FSA is connected to the PPO plan. Dependent Care Account – pre-tax money can be put into this account to pay for an employee’s child care expenses. Tuition Reimbursement – employees that wish to return to school to pursue a work related degree can be approved to up to $5000.00/year and 90% of the cost of tuition. Short Term Disability – is offered to assist employees when they are unable to work. The plan pays disabled employees at 60% of their weekly rate up to $750.00/week. Life and AD&D Insurance – The HGC Group of Companies provides at no cost to employees, a $10,000 life insurance and AD&D policy. Employees can increase this coverage if desired. Critical Illness and Accident Insurance – employees can elect coverage through UNUM. At HGC, we believe companies have a responsibility to help their clients, employees, and communities thrive. Our team is committed to using its resources to continue to Build Every Day. Our work environment, our extraordinary culture, and our eighty-six-year history bring about endless opportunity. WE OPERATE ON A DIFFERENT PLANE. Whether you are looking for an opportunity in Project Management or Field Operations, you’ll be making a commitment to developing your career with a group that’s dedicated to your growth. We offer a creative work environment, opportunities for learning and career development, excellent salaries, and a comprehensive benefits package. SOMETHING THAT THE DOLLAR CAN’T BUY. At HGC, we strive to capitalize on the future growth of our organization by leveraging our extraordinary culture. Doing so helps us to elevate what matters the most – strong connections to our clients and to each other. We are the sum total of our parts. Whether a firm handshake or a welcoming smile, when put together successfully, we create an experience for our clients and colleagues that is powerful and unmatched. WE ARE INVESTED IN GROWING OUR EMPLOYEES. At HGC, we are making a concerted effort to develop our employees, both personally and professionally. From our Leadership Academy and Safety University, to our Hands-On Skills Training and Masonry Summit, we’re building into our Team Members in effort to enrich their lives, deliver on our promises, and make the world a better place. Our commitment to our clients and community is simple. We will continue to deliver an outstanding product, empower our employees and support the communities in which we live and work. WE ARE INDIVIDUALS CALLED TO BUILD. ARE YOU? At HGC, we take the long view and see the world differently. Our commitment to our employees and our clients never ends. We stand behind our work and get the job done right every time. Doing so has been part of HGC’s culture for over eighty-six years and counting. Our culture encourages growth and opportunities for young emerging leaders, and you can take comfort in the knowledge that your managers will train you for the next steps in your career. We are committed to your success. HGC’s academic internship/co-op program will prepare you for a well-rounded future in construction. Our program allows you to gain hands-on experience in project engineering and field management. We carefully match you with positions related to your academic and career goals, setting you up for the right career path after graduation.